Would you love to save money and help the planet? Whether you want to (1) find all-natural solutions to common problems, (2) protect the environment, or (3) discover all the incredible benefits of going green, this audiobook will teach you everything you need to know. Going green is a win-win proposition! Learn how to make your life better while helping the environment! This audiobook contains simple steps you can follow to save money and improve your health while living a greener life! Everybody wins when you go green. Most people would agree that it's important for us to take good care of the planet we live on. It just makes sense not to trash our own space. Discover easy-to-implement tactics that cost little but have a huge impact the planet - and your life. "Environmentally friendly" also means "healthy". Green living is the healthier option. When you use cleaning solutions that are good for the environment, you're creating healthier breathing room and a much less toxic space for everybody. The tips and strategies in this audiobook not only have an impact on a global scale; they can also benefit your neighborhood. You help foster a healthy economic community by shopping at stores that encourage customers to bring their own bags instead of pumping out more plastic. When you carpool, you are building community directly. Best of all, as your children see your example, they will be much more likely to live responsibly toward the planet. It's a great time to go green! Help the environment and yourself: Buy it now! Great book for children! provides foundational insight on how to become more eco friendly! Hope to buy more books! There are so many helpful and yet simple ideas to go green. From recycling to repurposing there are many ways to go green. So many options in power and water reduction as well. Get your green life going today! McCloud shows that it's easy to go green. With the amount of pollution in the air and land, there are many ways to help alleviate some of it. He offers tips on going green in your daily life through recycling. He also offers tips on cleaning up trash through volunteering and other methods. Finally, he shows you that you can waste less by reusing items that you never thought about. 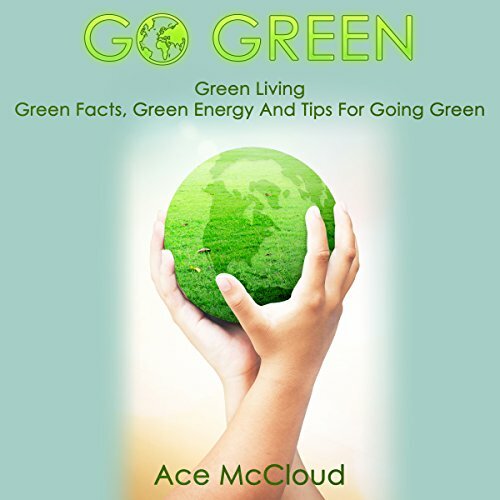 McCloud's clear and concise writing makes this audio book easy to understand and informative for anyone that wants to make a bigger difference in the environment. Fantastic tips to help you go green & save energy! What made the experience of listening to Go Green the most enjoyable? The narrator's clear and precise tone on top of his rather enthusiastic presence when speaking throughout the entire story. What other book might you compare Go Green to and why? Health & activity. Because these previous titles were also centered around how you can bring healthy activities into your life in order to improve your quality and standards of living. Yes, this performance is right on point with the rest of his performances. I like how clearly he pronounces his words and the clarity in which he speaks throughout the entire story. How simple it can be for you to save energy and maintain green standards throughout your entire household. It really only takes thinking and some intuitive practices in order for you to maintain a green and healthy environment. This is an amazing book that has many great tips and tricks on how you can begin to implement practices into your daily routine which will help you live a greener and healthier life. I hadn't even thought about many of these tips prior to reading this book however once I read this material it would seem to me that there are many average ways in your daily life which you can go about being green without having to think much about it. These tips are simply amazing, from recycling habits, energy conservation tips and how to prepare green meals there are several great ways that you can become a green master in your life by following these simple tips. Take the time to at least give this a sample read before purchasing in order to make sure it has all of the tips you are looking for and expect.